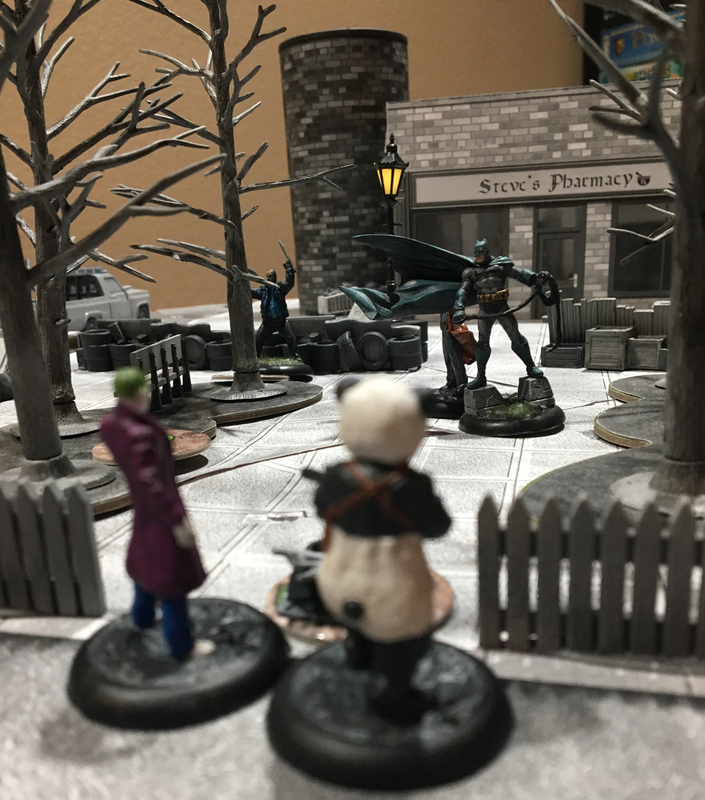 All this Batman reading has me pushing the Batman Minis Game again and I was lucky enough to get in game this weekend. My friend and I set up a 200 point game with the same Batman and Joker crews we had last time but this time we were able to complete the crews with funding and equipment and used a full scenario with objectives. 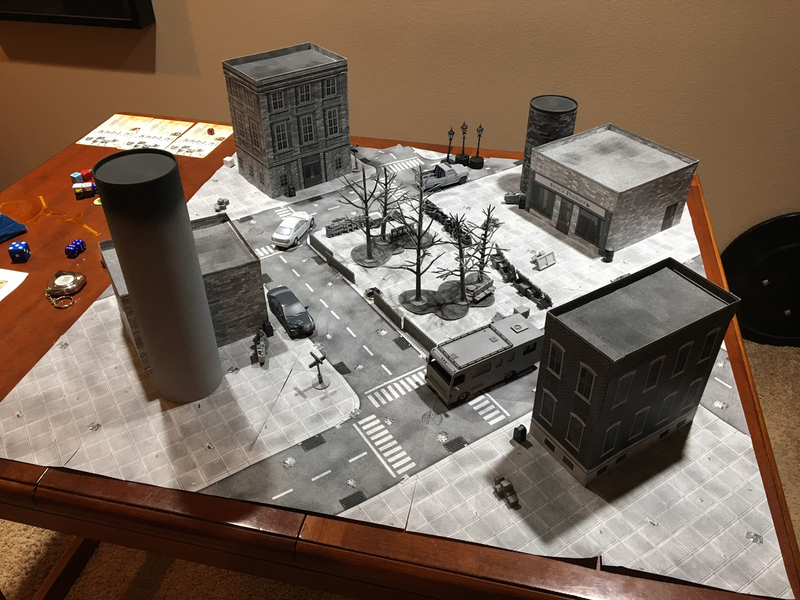 I picked out the Scenario 1: Arrival from the new v2 Rulebook. This scenario has each player starting in the corners with the objectives in the center to force more confrontations. 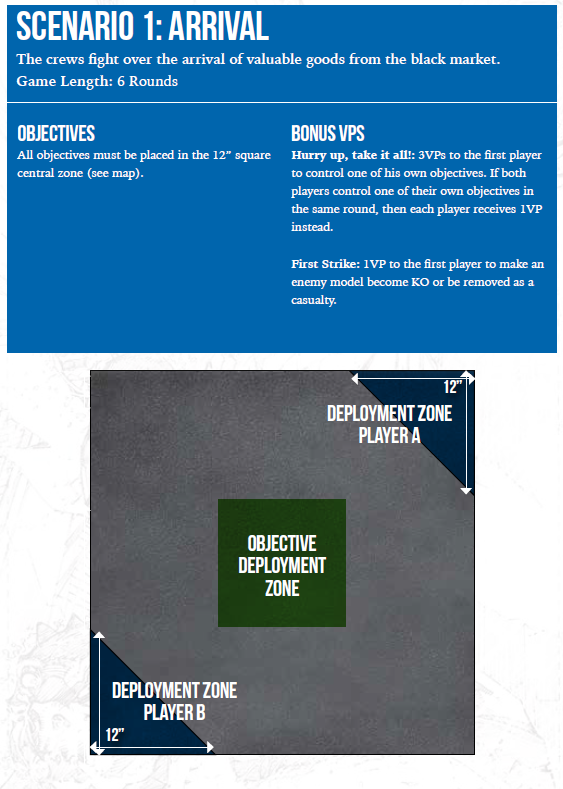 I like that not only does the scenario force interaction by putting everything in the center, it also wants to push us to get there quickly by giving players a bonus if they can be the first to control their objective. 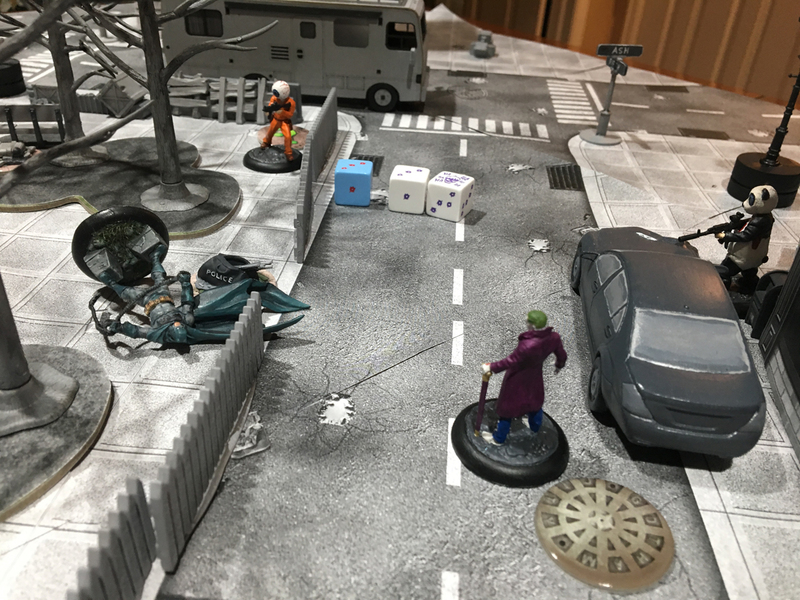 We started off in our respective corners and I won initiative, electing Batman’s crew to start. 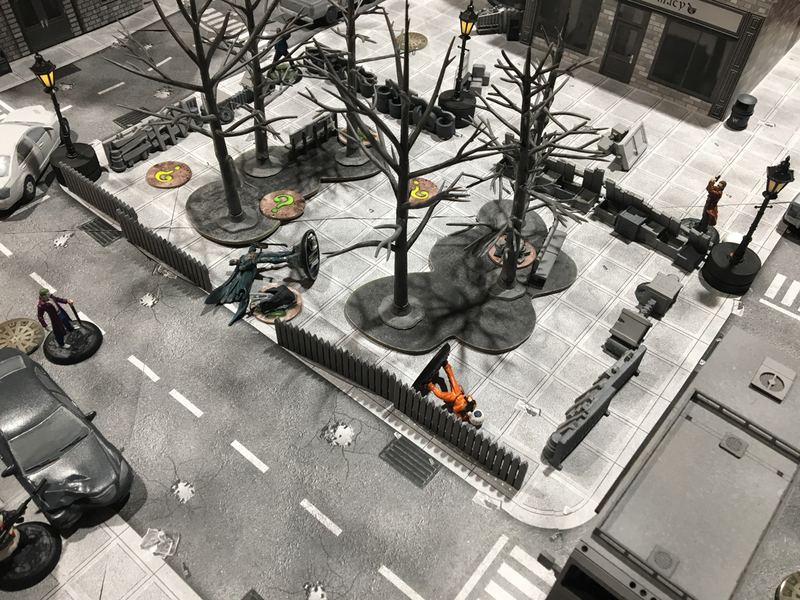 Gordon and Batman started as far to the front of their deployment zone as possible. 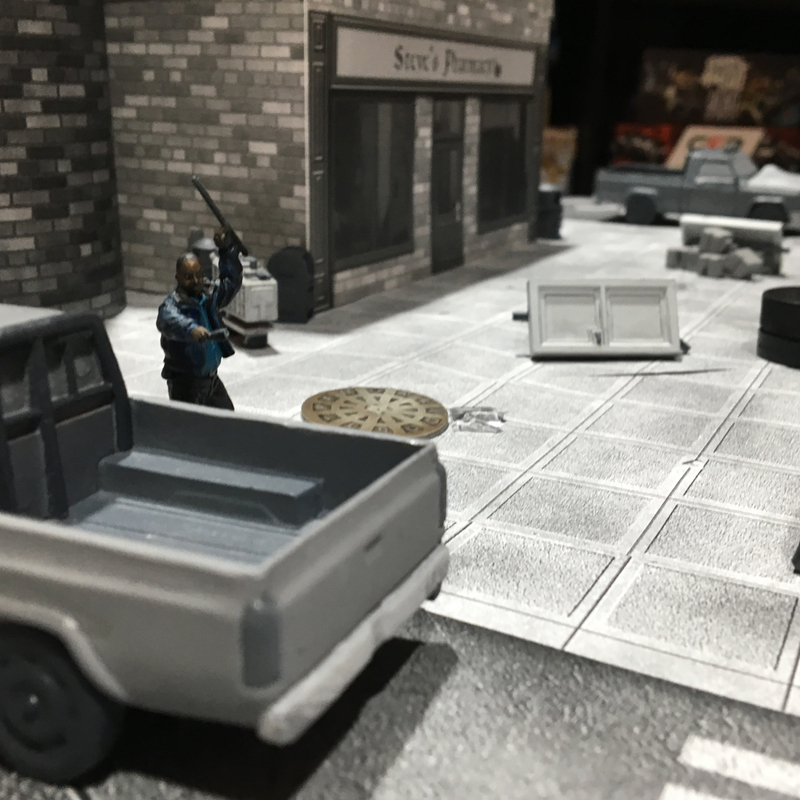 While Fat Cop (I don’t remember his card name) started Undercover and was able to deploy within 4 inches of the first objective. 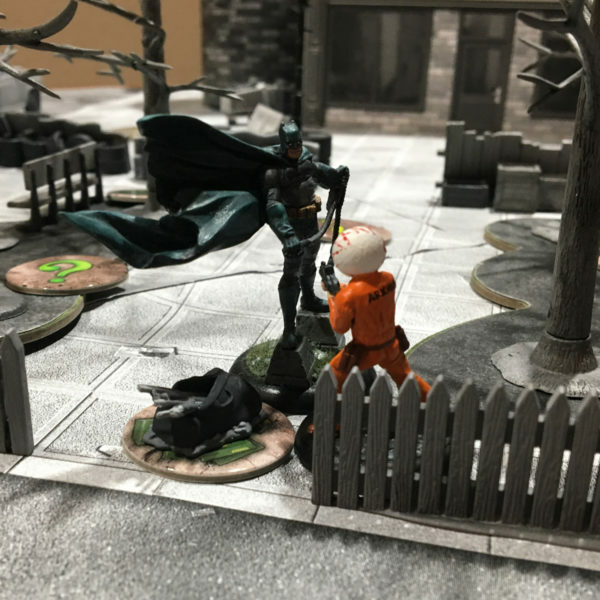 I knew Batman would be able to Batclaw out to the objectives quickly but I hadn’t counted on Fat Cop getting the jump on my as well. 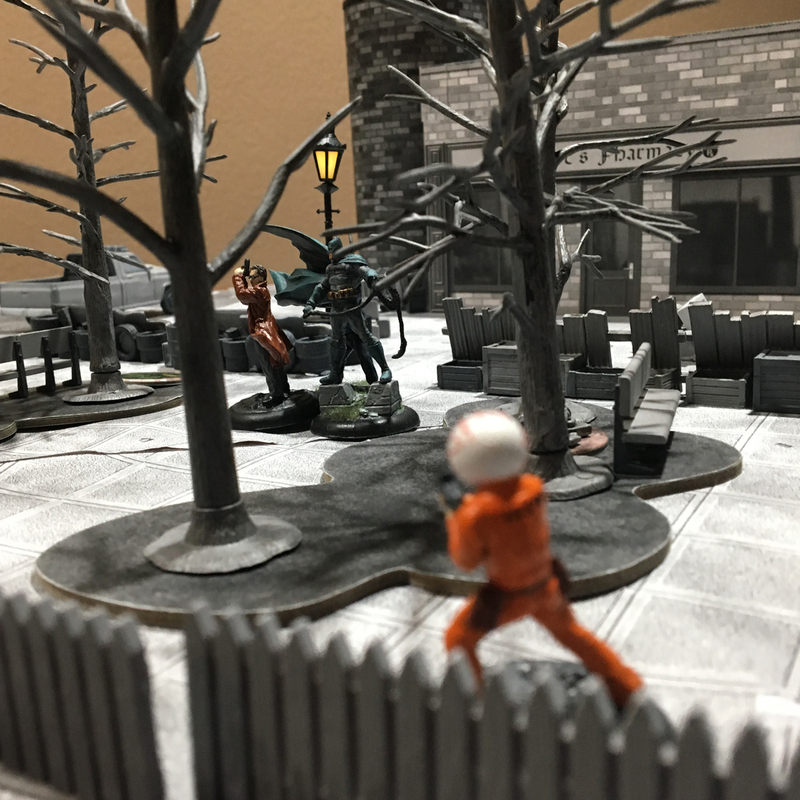 Luckily, I also decided to upgrade for the scenario and chose for Eyeball Man to have a Grappling Gun to compete with Batman’s speed. The Grappling Gun is pretty great on Eyeball Man since, unlike most other guns, his gun has Assault 3 which allows him to still get 3 shots off while he moves, instead of the normal 1 shot after moving. 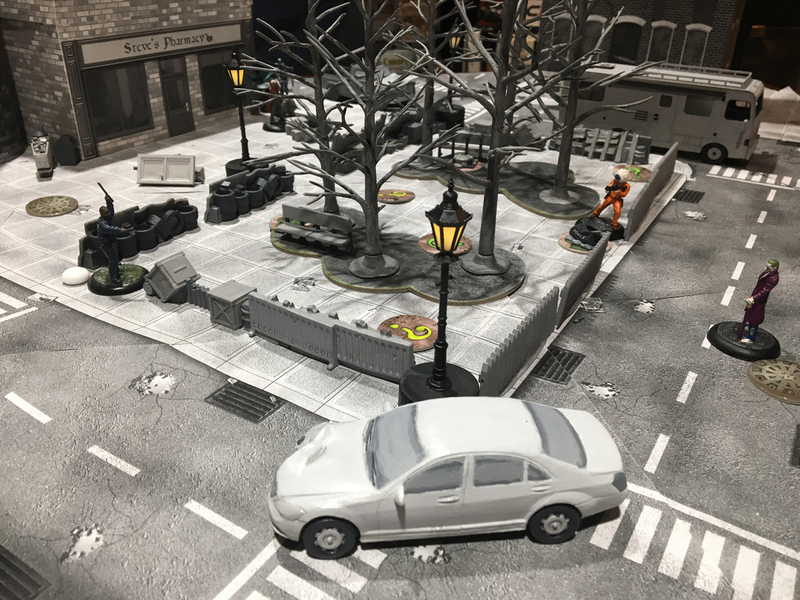 Gordon and Batman push in to the map, taking cover behind some debris. Fat Cop easily moves in and grabs the first objective: Loot. Apparently the salaries are pretty weak on the GCPD. 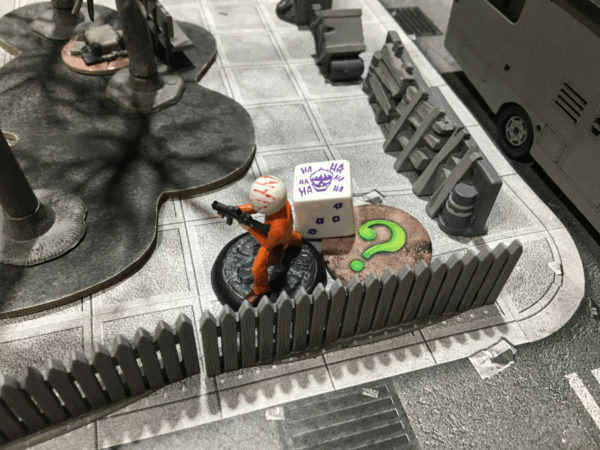 Not to lose out on the first VP opportunity, Eyeball Man Grappling Hooks out to the Ammo Crate objective (with the help of Joker’s Inspire and Follow Me! abilities). This lines him up for a good shot on Fat Cop. Eyeball Man sprays Fat Cop but the trees and benches get in the way taking Ping! from my hits. Next time, Fat Cop. Next time. The Brave and the Bold get the initiative and elect to go first. 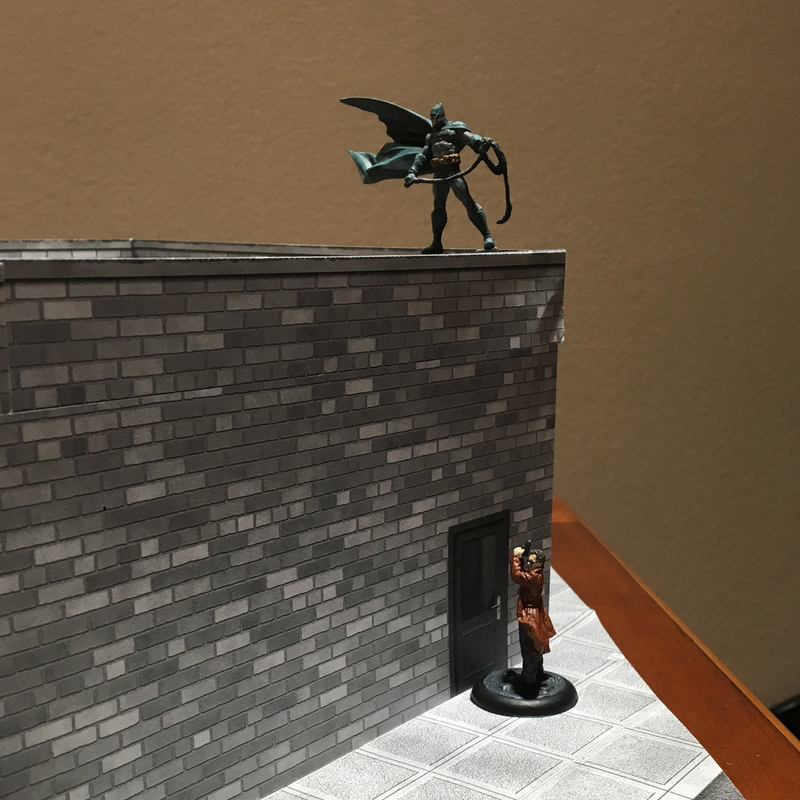 Batman uses his Batclaw to swing into position and Sneak Attack Eyeball Man. This usually always ends with Eyeball Man out cold but the dice are just bad enough to keep him up with one health left. Almost unconscious, Eyeball backs into the park’s corner with my Riddle objective and sprays Batman. 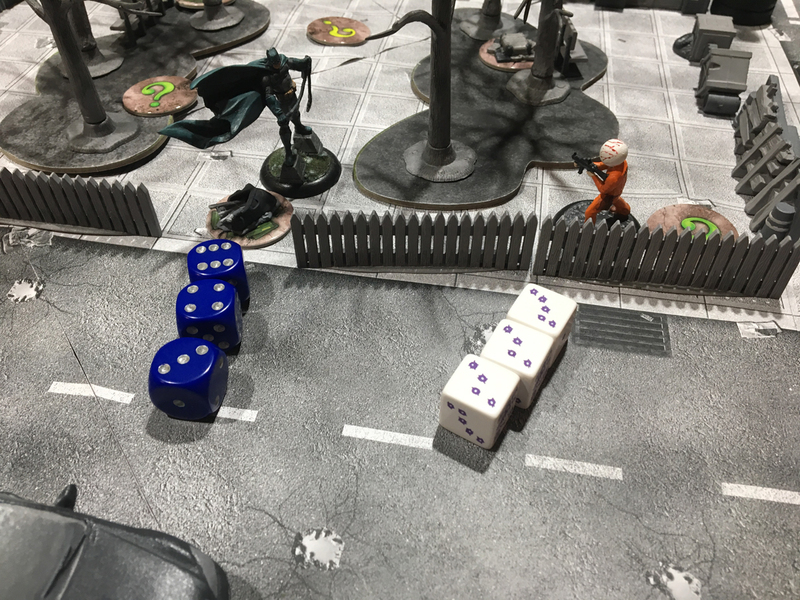 I’m able to hit Batman with all three shots and get two hits through his Batarmor (blue dice on the left needs 5+). And totally rocks the riddle. Riddler must be slacking for a barely conscious thug to solve his trick so easily. I see the MVP award may have already found its candidate. Well. Almost. 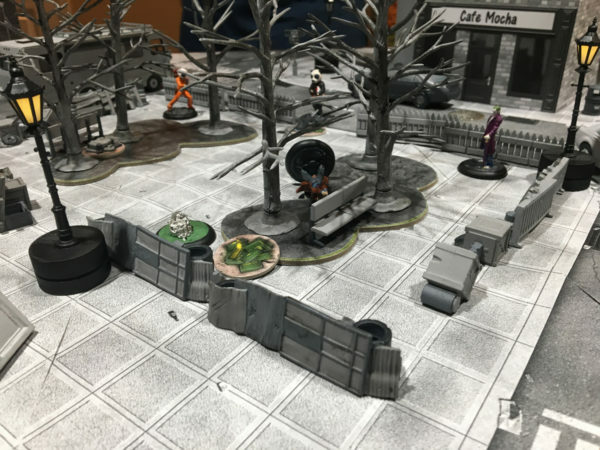 Gordon is able to move up and with a single shot, take down Eyeball Man. 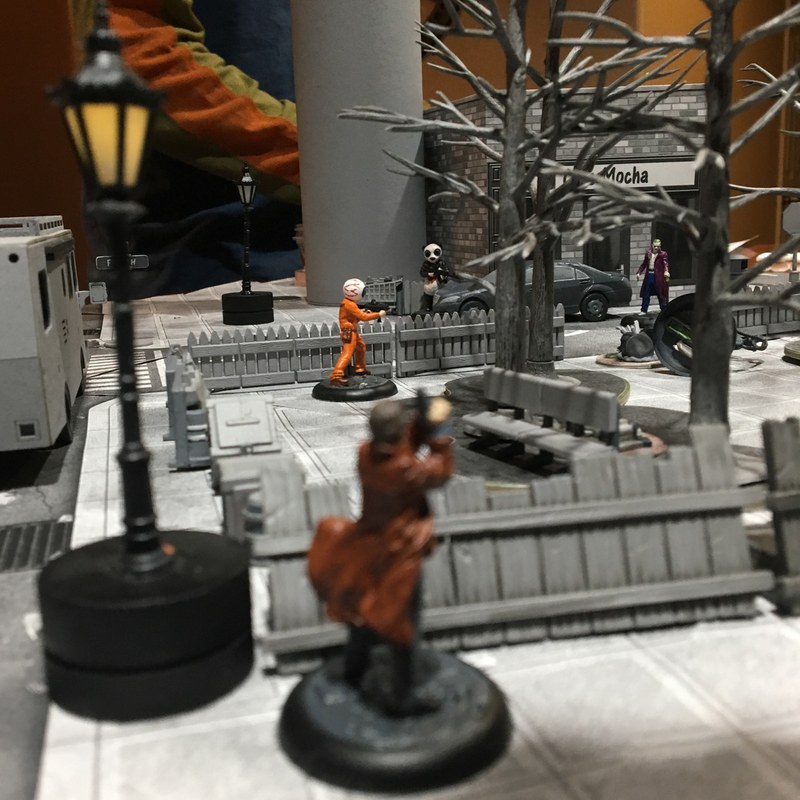 With Batman down, I had a decision to make, engage in melee or keep shooting. I don’t get any advantage against him prone with my guns but I do a lot more damage. Or should have. Both Panda Man and Joker unload on Batman and I get only one of the six shots to take thanks to poor attack rolls and average Batarmor rolls. 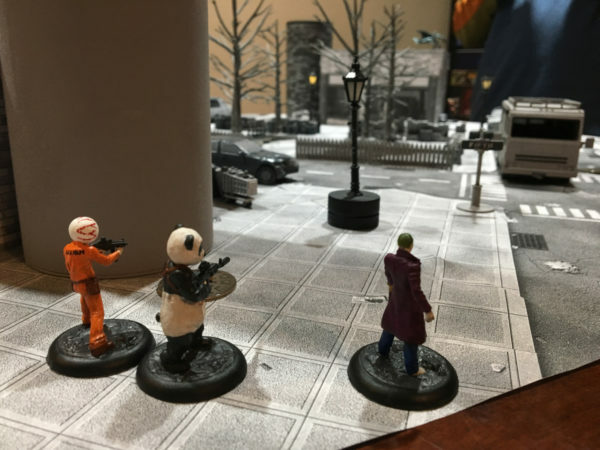 Joker and Panda Man then get up to control the Ammo Crate and restock on ammo. I get to start the next round and unload again on a knocked down Batman (electing to shoot instead of engage in melee). Full auto on all my guns and nothing. 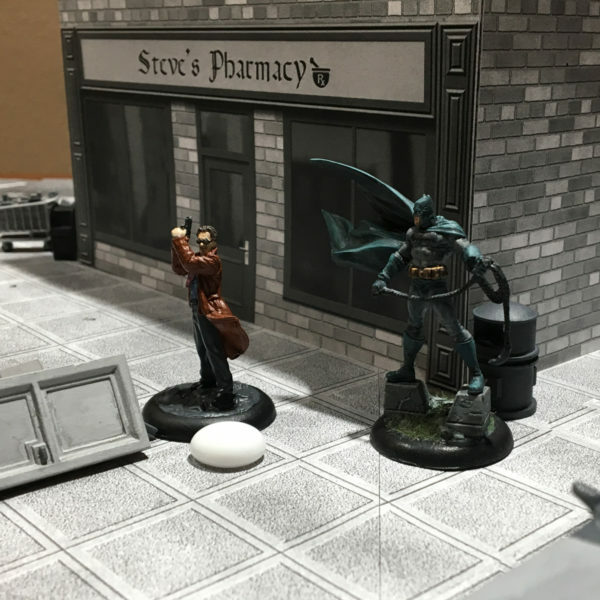 Average attack rolls should have seen at least a few more hits on Batman but he dominates the Batarmor rolls and gets by without taking a single damage. Brutal. 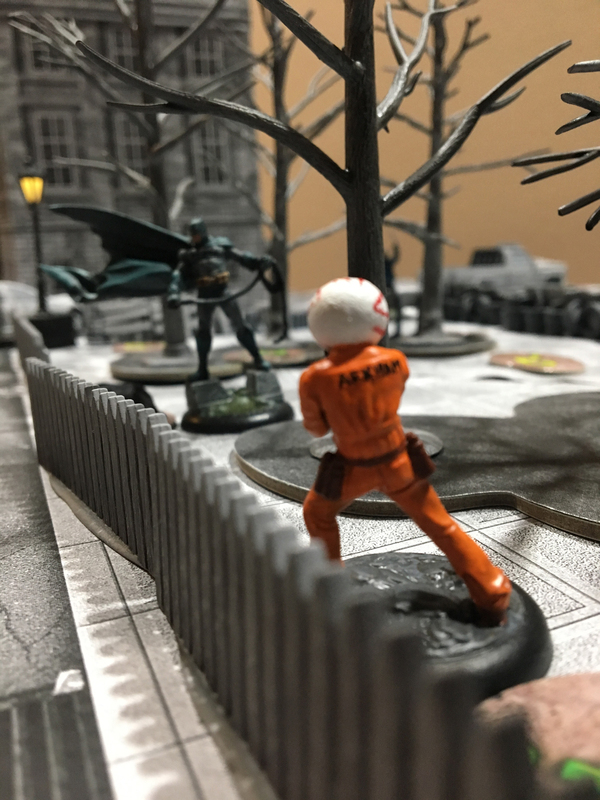 Batman is able to get up and regroup with Gordon and Fat Cop. Gordon put a hit on Panda Man. 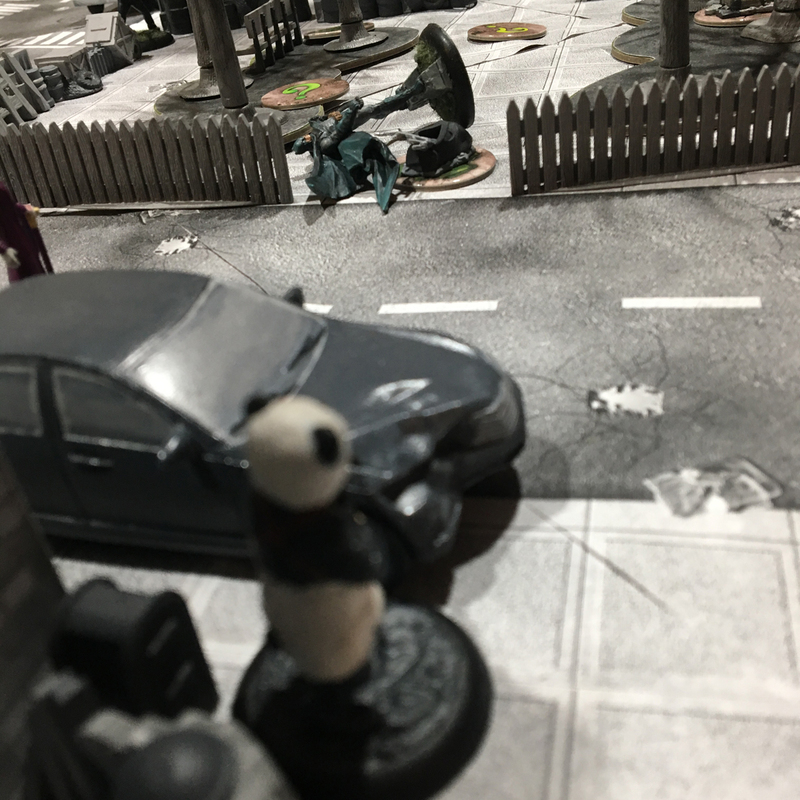 The round closes and my initial point lead has worn off and now the Brave and the Bold are scoring 4 VPs a round to my 3 VPs (not to mention the KO bonus for dropping Eyeball Man). Eyeball Man recovers but the Brave and the Bold start the round. And promptly drops Panda Man. 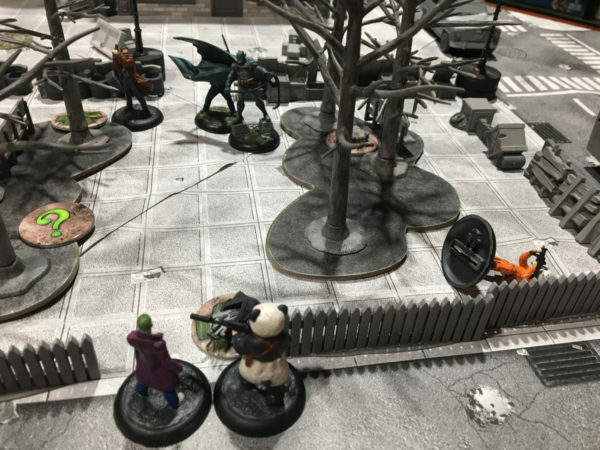 I totally misread this round and thought Batman was going to start with an attack on Panda Man to remove his nasty assault rifle so I put most of Joker’s action counters on attack, defense, and special. The special was to make sure Gordon couldn’t use his special ability to heal Batman but I totally forgot that Gordon could just unload on Panda Man instead. I was stuck with not a lot of options for Joker because I didn’t have enough movement. 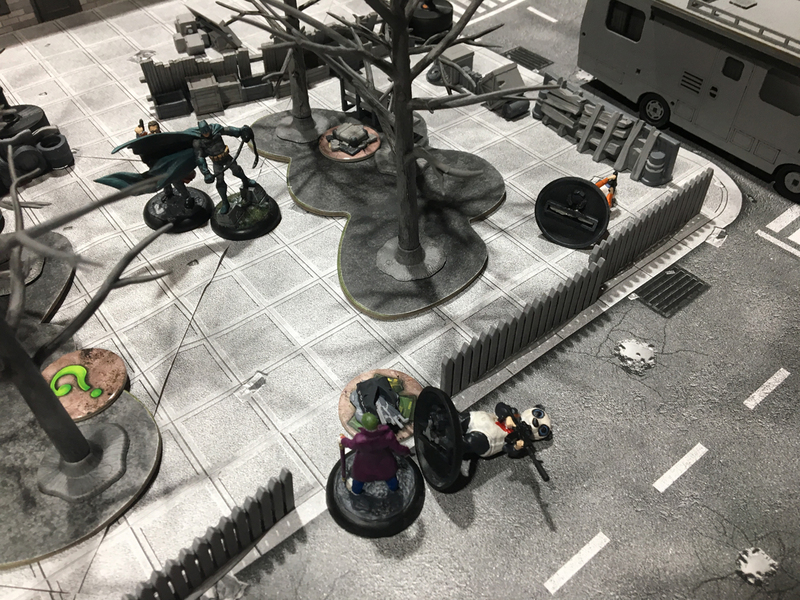 Joker tries to take down Batman once again but the Batarmor just doesn’t quit and blocks all my hits again. Augggghh… Batman promptly chucks a few batlings to smack Eyeball Man and knock him out again. Round 4 ends with both crews tied on VPs and my goons are sleeping like overpaid babies. Luck shines on me with not one but both of my henchmen wake up again and I’m have initiative for the last round. 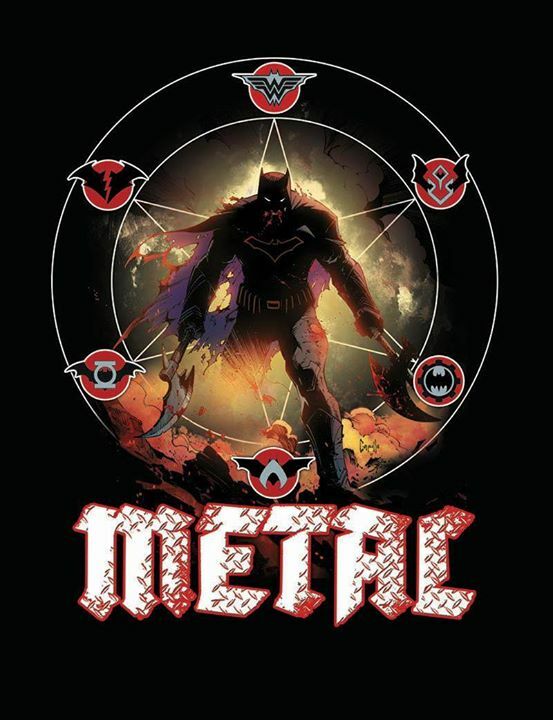 Panda Man tries to play the same damn song he’s played all night but this time, it was one too many Batarmor saves and Batman gets thoroughly shredded but the assault rifle. Yeah, red beads are bad. This nets me a game ending 6 VPs. 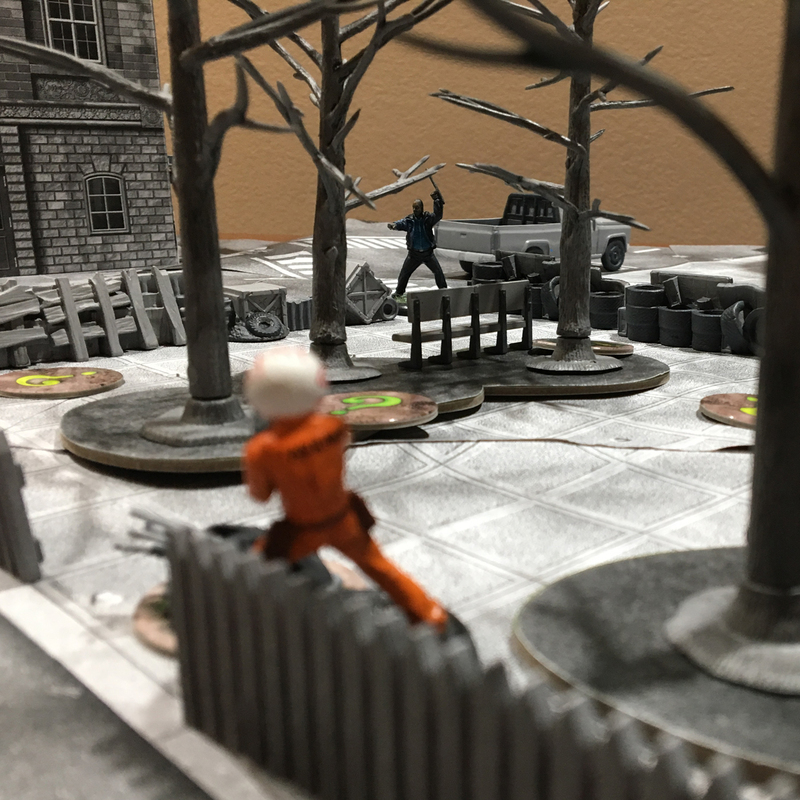 We finish out the turn with Gordon doing what he can trying to get some VPs via one of my riddle objectives (but fails). Eyeball Man decides to full auto on Fat Cop to make for a nice bookend. This time all shots connect and, true to every game we’ve played, Fat Cop dies. 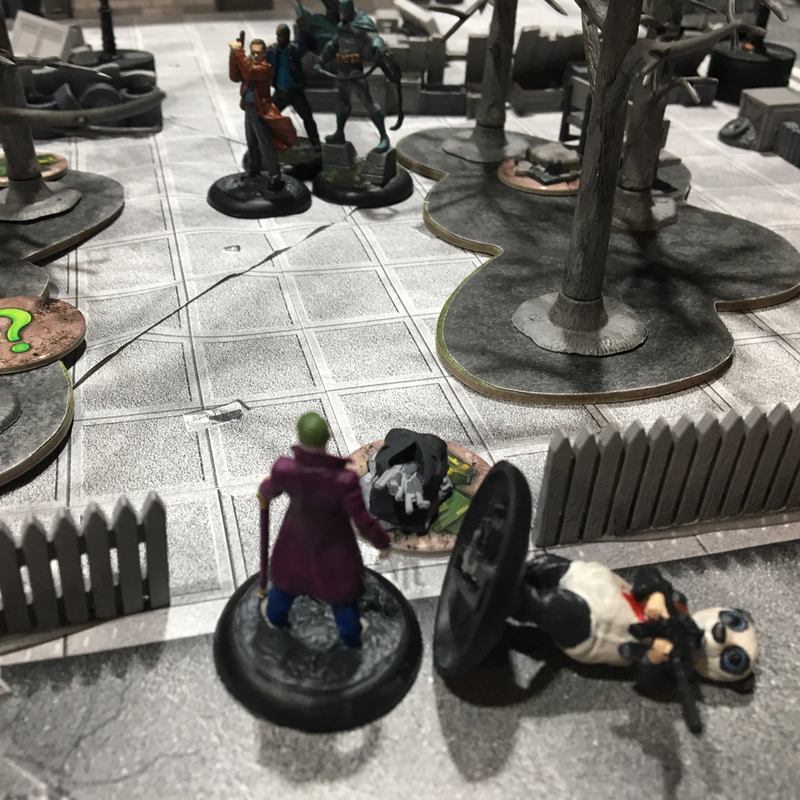 Joker takes a last pot shot at Gordon and knocks him down (but not out). A fitting end to a brutal last round. The VPs show a pretty lopsided finale but had Batman’s Armor held or my rolls went cold again, this would easily be a loss for team Joker. I think we’re finally getting into the groove on the rules for this game (with a healthy dose of custom cheat sheets). We both are feeling that Gordon really not the right character for Batman in this crew. I imagine he’ll get swapped out and some ranged threats added in. Also, I think we also went experimenting a bit to flex the strengths of the various crews. We kind of pot committed on standing ground where I focused solely on taking Batman down and Batman focused on staying in the fight to see how hearty he could be. He totally proved his worth but I should have taken out Fat Cop and Gordon early instead and worked on Batman at the end while maintaining a VP lead. I think Batman could have tried to engage both Joker and Panda Man at the same time, forcing them to always move and shoot (reducing their shots down to one for each attack action, instead getting their full rate of three per attack). 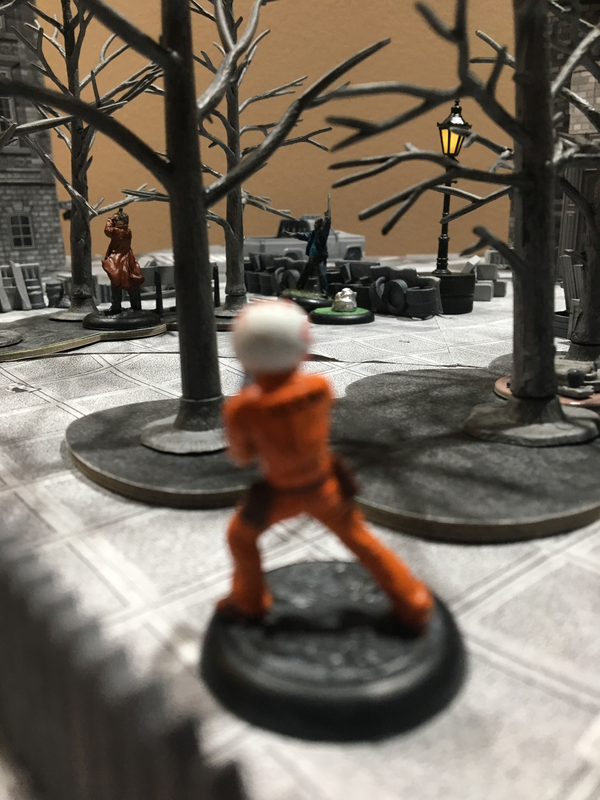 In any case, it was a great game with a lot of ups and down and wild luck helping Batman survive way longer than he should but also my henchmen regaining consciousness at just the right time throughout the match and getting lucky in the early game. 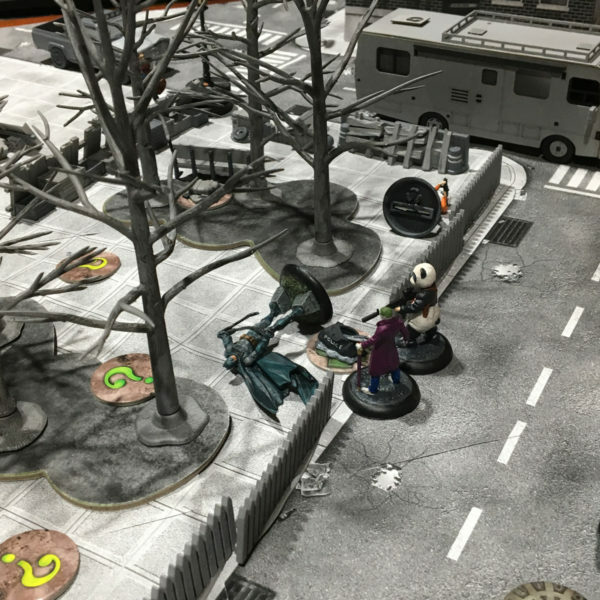 Don’t forget joker and his henchmen all have trickster thanks to kaos agent and can reassign all their counters when they activate. Makes them really versatile! Thanks! Joker (from Suicide Squad) doesn’t get Trickster though, only gives it to his henchmen. 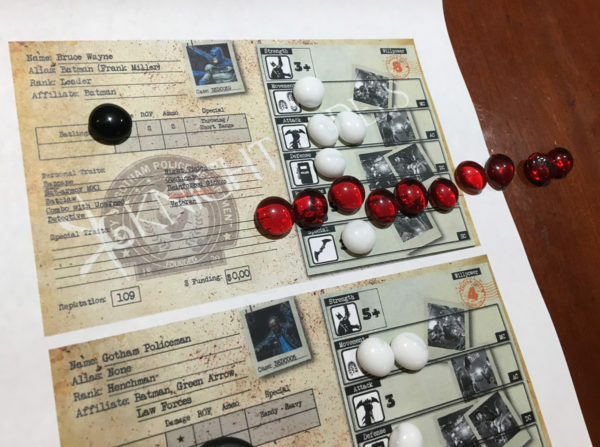 Unfortunately, my henchman usually had what they needed already allocated and I kept screwing up Joker’s activation counters.